The most important requirement for the motor is to be a DC motor that works at low voltages. Since you’ll be holding it in your hand, it should not work at voltages higher than 36V DC. The power can come from a variable power supply or from a fixed power supply (with or without PWM controller). Shaft diameter is important when looking for a way to fix the drill bit to the motor. Based on the most popular types of chucks, you should get a motor with a shaft diameter of 2, 2.3, 3.175 or 5 millimeters. Now, let’s see what you can attach to such a motor. Although not designed to be used as chuck, it works as long as you use drill bits with consistent diameter of the shank (usually 3.175 mm). Therefore, you need a coupler that matches 3.175mm to the shaft of your motor. This approach has the advantage of being cheap and precise. The coupler is shorter than chucks so you can hold the tool better in your hand. However, you need a hexagonal key every time you need to change the drill bit and you can use only drill bits with fixed shank diameter. 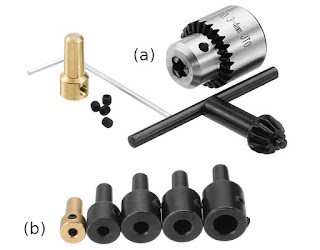 The simplest drill chuck available for motor shafts of 2, 2.3 and 3.175 mm diameter. The clamps are part of the chuck and a fastener tightens them around the drill bit. This design allows a limited clamping range, usually no more than 0.5 mm. Such chucks come in various sizes and you should choose a size that matches the drill bit you’ll be using most. Although some claim it can be tighten by hand, the brass alloy is quite rigid and you may not get enough grip without using some pliers. There is only one lateral screw to fix chuck body to motor axis. If you use only one drill bit size, this type of chuck is a good, cheap choice. 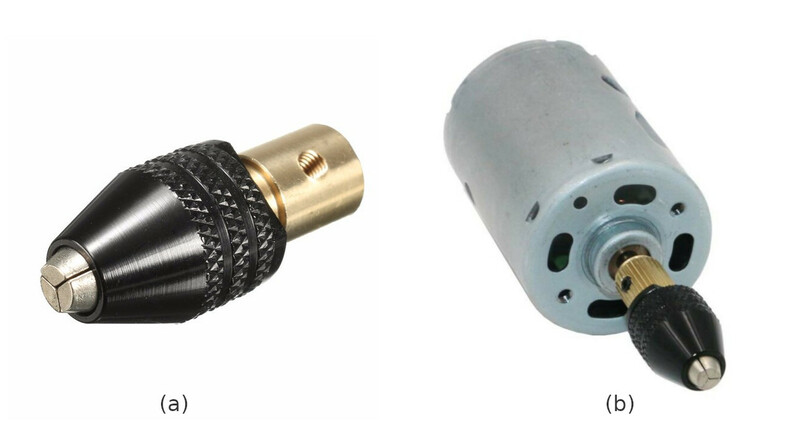 It is also a good choice for small motors with thin shaft. To improve clamping range, the clamps are part of an additional piece, the collet. When you change the drill bit, you need to match it with the right collet size. This type of chuck is similar to Dremel tool chuck. 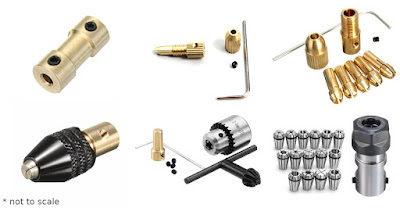 Since the collets are replaceable, it is important to know that there are at least two sizes of collet diameter. Such chucks are designed for 4.3 mm or 4.8 mm collets. A good thing is that all these chucks come with a set of collets. This set contains collets with 0.5 mm to 3 mm clamping. A collet for 3.175 mm drill bits is usually not part of the set. Chuck body is fixed to motor shaft with two screws. This chuck is small, lightweight and reliable. Collets are not very rigid and can be tighten by hand. If you lose the fastener, you should know that screw thread varies with manufacturer and common fastener screws for Dremel may not fit. Also known as three jaw head design drill chuck, this one has improved clamping range. This is because the three clamps are individual pieces now, no longer fixed to chuck body. It can be tighten by hand and it is compatible with regular drill bits and 3.175 mm fixed shank drill bits. The usual clamping range is from 0.3 mm to 3.5 mm. That’s a huge improvement from the previous type. This type of chuck is available mostly for 3.175 mm shafts. Other sizes include 2.3 mm, but are not as available. Chuck is fixed to motor axis with two screws. The three jaw head chuck (a) fixed to the motor (b). This is a small version of the classic chuck used at drill tools. It comes with a coupler for different motor shafts. There are two products. JT0 is the smaller chuck, with a clamping range of 0.3 to 4 mm. 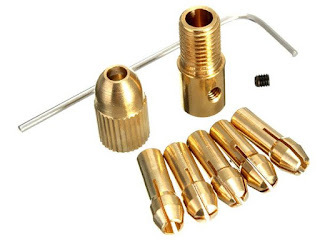 I regularly use one of these attached to a 3.175 mm motor for PCB drilling and it has an incredible precision. The bigger version is B10, with a clamping range extended up to 6 mm. Not as precise as JT0, this is a better choice for bigger motors. I use a B10 chuck with a 775 motor as rotary tool. It’s definitely not suitable for PCB drilling (big and heavy motor, breaking the drill bit is inevitable). To fix the drill bit you need to use the provided key. Such chucks can be fitted to 2.3 mm up to 10 mm shafts. Since it is bigger than the previous ones, it is not suitable for small motors. Fitting sleeves are sometimes sold separately. 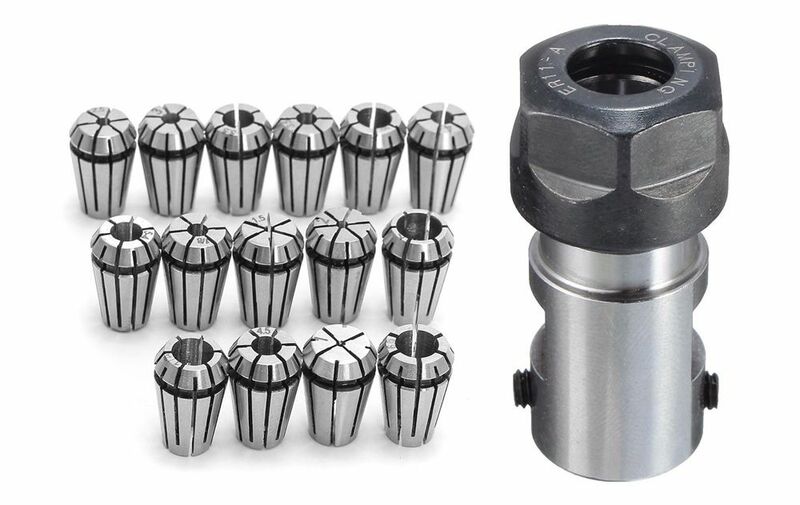 JT0 drill chuck (a) and coupling sleeves of different sizes (b). Designed for CNC milling, these are the most expensive chucks. They are carefully built to ensure maximum precision. The smallest one is ER11-A and fits to a 5 mm shaft. It needs compatible collets. The price for this chuck and a set of collets is usually more than 20 USD. A key is used to tighten the fastener. 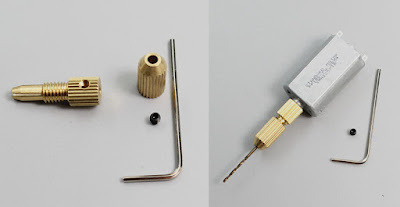 Since the smallest shaft diameter is 5 mm, these chucks are not for small motors. If you decide to build a rotary tool with this chuck, pay attention when choosing the collet set. 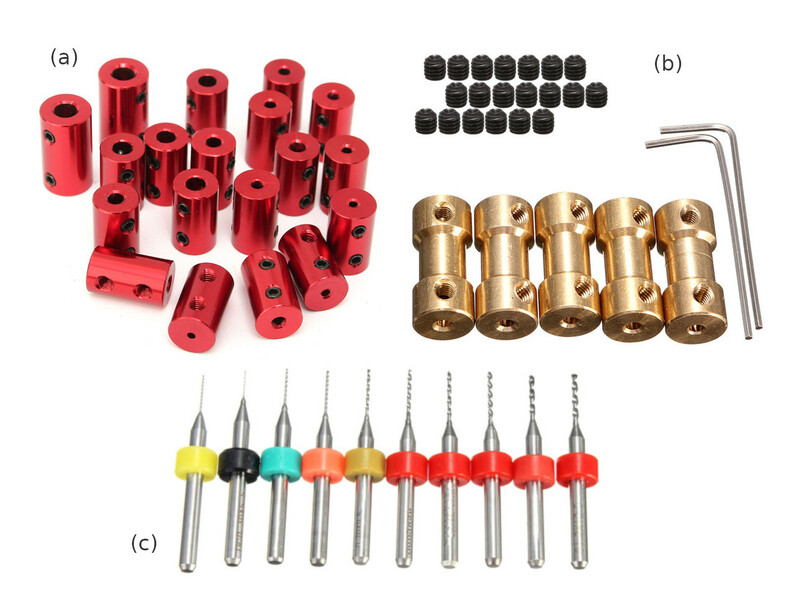 There are sets with metric clamping sizes (1, 2, 3, 4 mm) and sets with imperial clamping sizes (1/16”, 3/32”, 1/8”, 5/32”). The common 3.175 mm drill bits are in fact 1/8”. If you will use only this diameter, there are cheaper kits of chuck with a single collet of 1/8”. These are the main types of small drill chucks that you can use to build your own rotary tool. You can fit them almost to any motor shaft. For small motors an on/off push button is usually enough without needing a speed controller. This post uses product photos from Guangzhou Banggood Technology Co., Ltd. and AliExpress.com. These companies sell and ship worldwide such items.